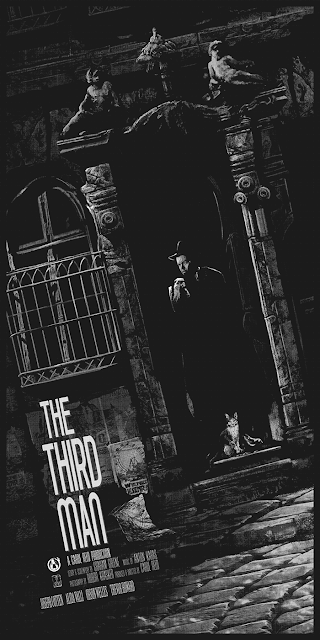 Later today, Mad Duck Posters will be releasing an officially licensed poster for the 1949 film The Third Man by Pittsburgh, PA based artist AJ Frena! AJ is very passionate about the film, and this excitement can clearly be seen in her outstanding design. For those not familiar with the movie, it was directed by Carol Reed and stars Orson Welles and Joseph Cotton. It is widely considered by film critics and fans a like to be one of the best noir movies of all time! Do yourself a favor and check this movie out if you haven’t seen it already. The Third Man by AJ Frena is an 18”x36” hand numbered 6 color screen print with silver metallic ink. Limited to just 130 pieces, this officially licensed retro movie poster will go on sale Wednesday, February 22nd, at the Mad Duck Posters online store for $65.